SOHC 4 valves x cyl. The Honda G-series engine is a family of slanted inline-five cylinder gasoline engines; the engines are SOHC with 4 valves per cylinder. They were originally used in the 1989 Honda Vigor, Honda Rafaga, Honda Ascot and Honda Inspire. They carried over to the Vigor's successor the Acura 2.5TL, which ran from 1995-1998 in North America, and the Honda Saber in Japan. Some people colloquially refer to an F-Series block (found in Accords) with an H-Series head (found in Preludes) as a "G-series" engine. 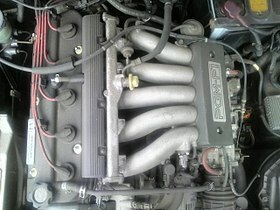 This combination of an Accord bottom end with a Prelude head has nothing in common with the actual G-series engine. The engine is longitudinally-mounted and resembles an F-Series single cam engine (found in early Accords) with an extra cylinder on it and a shorter stroke. Found in the 1989-1991 JDM Inspire/Vigor (CB5), 1992-1994 JDM Inspire/Vigor 20 (CC3), 1993-1997 JDM Ascot/Rafaga 2.0 (CE4), and 1995-1997 JDM Inspire/Saber 20 (UA1). Found in the 1992-1994 JDM Inspire/Vigor 25 (CC2), 1993-1997 Ascot/Rafaga 2.5S (CE5), and 1995-1997 JDM Inspire/Saber 25 (UA2). Found in the 1992-1994 USDM & CDM Acura Vigor (CC2). Found in the 1995-1998 USDM & CDM Acura 2.5TL (UA2). Geier v. American Honda Motor Co. This page was last edited on 15 February 2019, at 18:10 (UTC).